Google recently teased the October 4 launch of its next generation of Pixel smartphones. However, as we approach the launch date, new renders of the Pixel 2 and Pixel 2 XL smartphones, which are tipped to be manufactured by HTC and LG respectively, have been leaked on the Internet. Further, the pricing of the regular variant has been said to start from $649 and for larger variant from $849 (roughly Rs. 54,600). The newly leaked renders of the Pixel 2 XL, shared by Droid Life, show the alleged handset from the rear end and also reveal the colour variants that might be offered with the smartphone. In the shared images, we can see a Black and another White/Black option of the smartphone with the latter variant having the top portion as black and bottom portion coloured white. Interestingly, the power button on the White variant seems to be coloured in some form of orange colour. As you can see from the images, the design on the Pixel 2 XL is quite reminiscent of the last generation model of the smartphone. However, just like the render that was leaked back in July, the new images also suggest that the Pixel 2 XL will not feature a dual camera setup like most flagships this year but will sport a single camera sensor at the back. 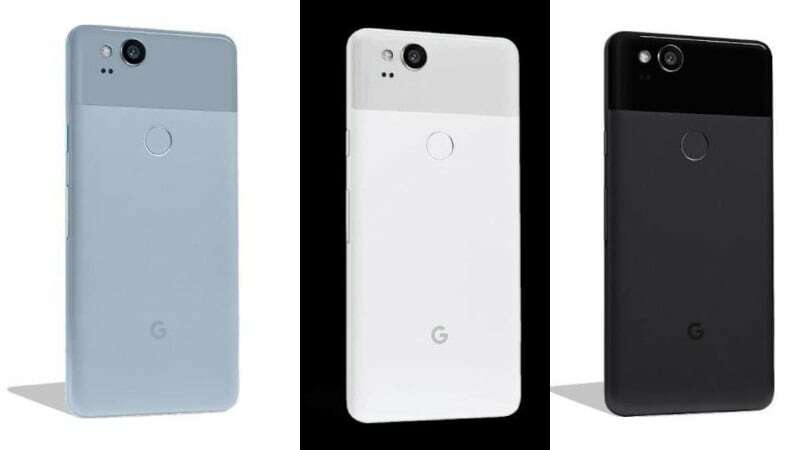 The Pixel 2 renders, also shared by Droid Life, show the alleged handset in colour variants: Black, White, and Kinda Blue. The rear-end design on both Pixel 2 and Pixel 2 XL is nearly identical. Moving on to the leaked pricing, the Droid Life reports suggest that the 64GB storage variant of the Pixel 2 XL smartphone will be priced by the company at $849 while the 128GB storage variant will set back customers by $949 (roughly Rs. 61,000). The Pixel 2 is also expected to be offered with 64GB and 128GB storage capacities at $649 (roughly Rs. 41,800) and $749 (roughly Rs. 48,200) respectively. To recall, the Pixel 2 XL is expected to feature a 6-inch near bezel-less display and while the smartphone is expected to be powered by Snapdragon 835 SoC. On the other hand, the Pixel 2 smartphone, which has been tipped to be made by HTC, is expected to offer a squeezable frame just like the HTC U11. As these are leaks, we will advise you to take them with a pinch of salt and wait for the official confirmation from Google itself.